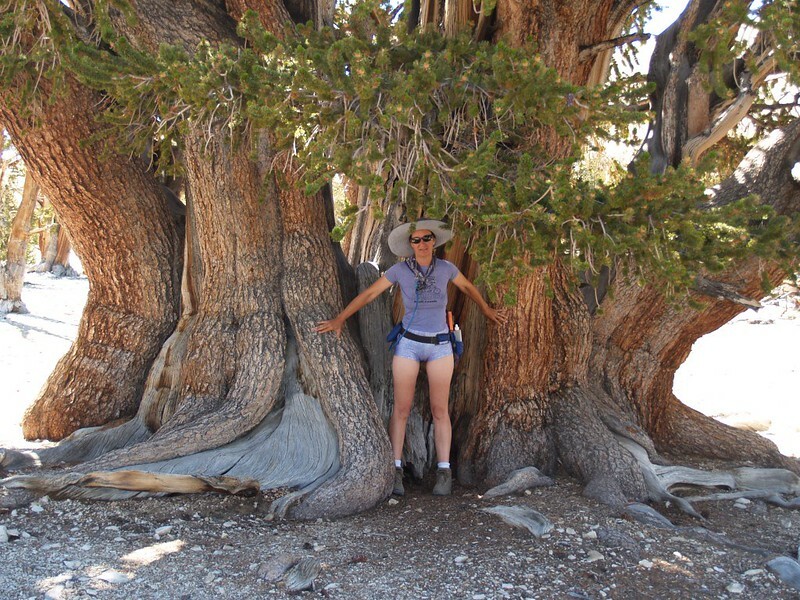 After five days high in the Sierra Nevada, we came down to the town of Big Pine for a quick break before heading upward and eastward, intending to check out the Ancient Bristlecone Pine Forest in the White Mountain Range. 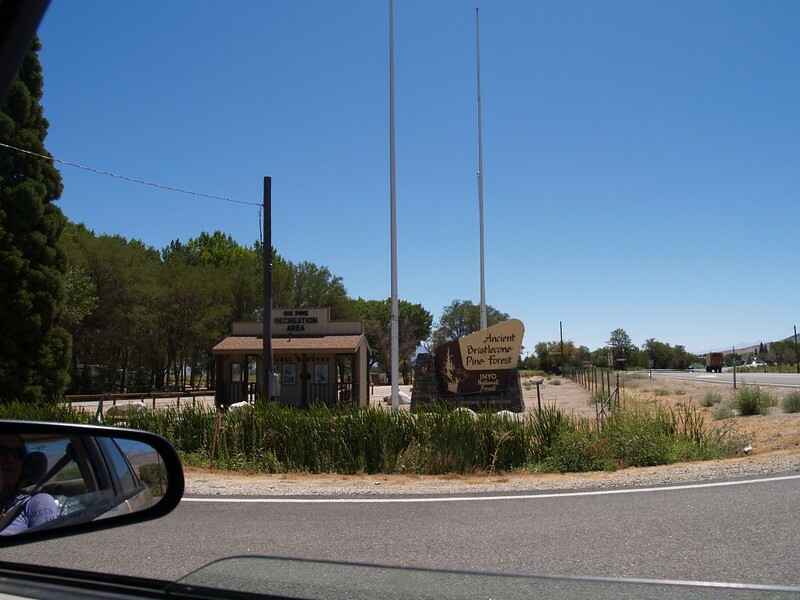 We began by driving up Highway 168 from the town of Big Pine. 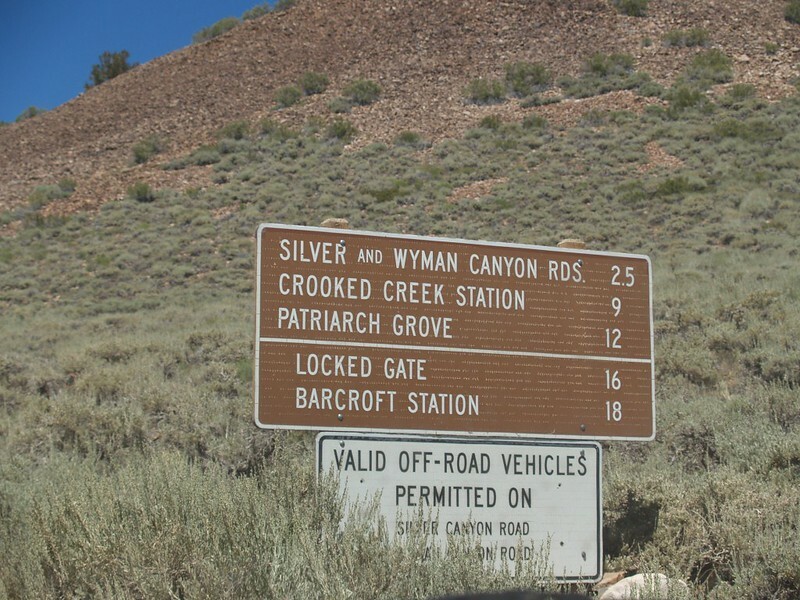 We turned left on White Mountain Road and continued relentlessly uphill, the road making loops and switchbacks like crazy as it gained elevation. Soon, we were treated to excellent views to the west, with the snowclad crest of the Sierra Nevada across the way, the mountaintops stretching endlessly north and south into the distance. 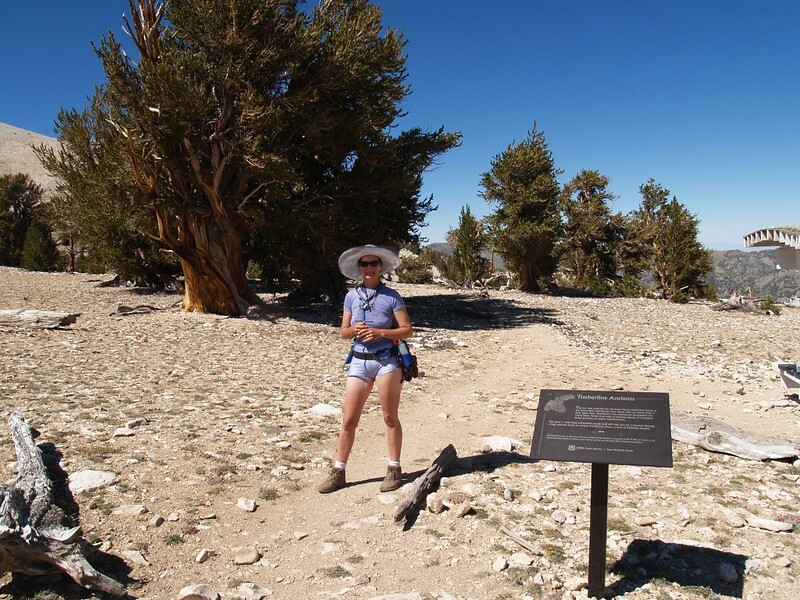 We arrived at the Schulman Grove, the main attraction of the Ancient Bristlecone Pine Forest, but the visitor center was closed for construction. 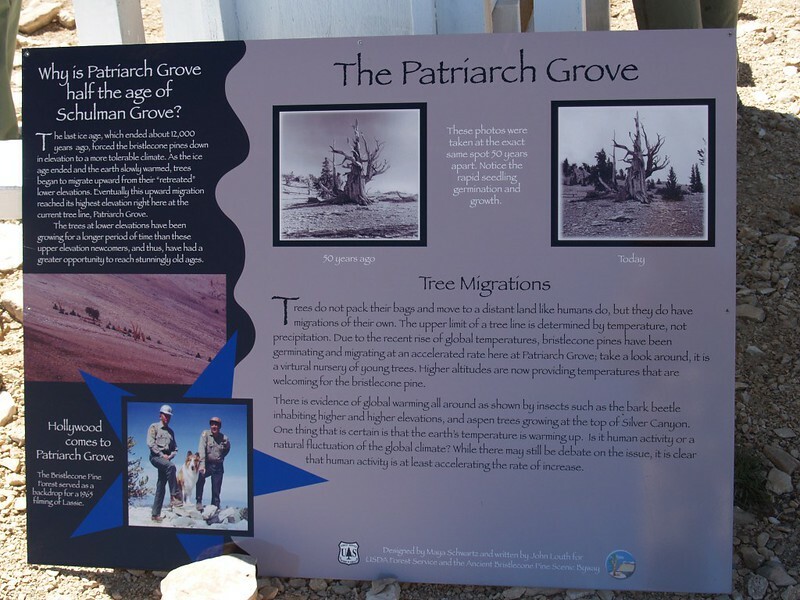 We decided to visit it another time, and continued upward toward the other famous area, the Patriarch Grove. Getting there, however, wasn’t easy, as it entailed driving another 12 miles on a dirt road. And the dirt road climbed and switchbacked just like the paved section, but was much, much slower. 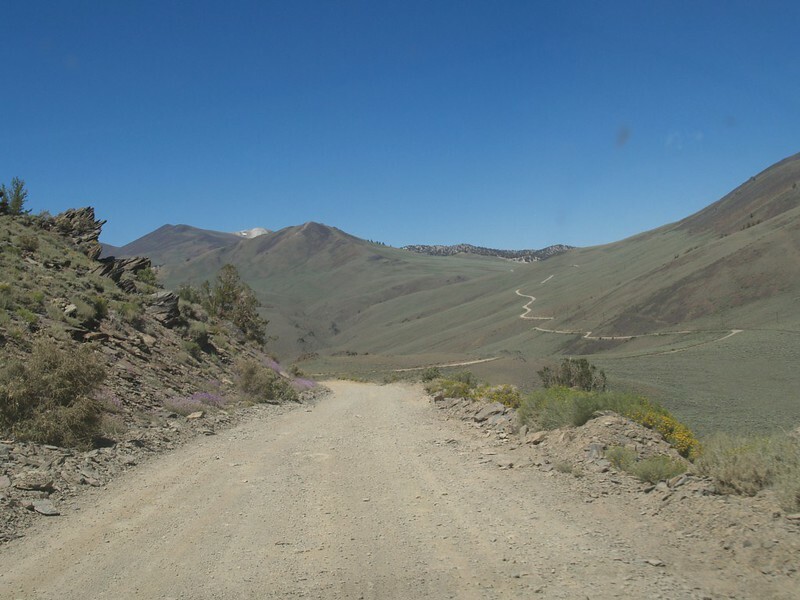 I had read that this road was also called the “Flat Tire Highway” due to the sharp shards of rocks in the roadbed, so we drove carefully to avoid the bad rocks. 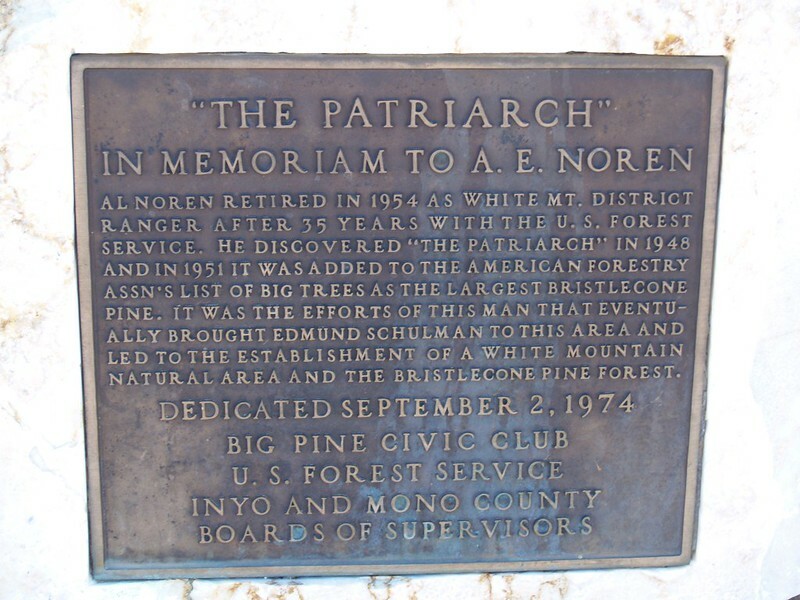 After an hour or so we made it to the Patriarch Grove, which was situated at 11,000 feet elevation. This was significantly higher than the usual 10k treeline seen in the Sierra, so I was already impressed with these trees. It’s cold up here, and Winter lasts about nine months. It could get frosty or snow during any month of the year. 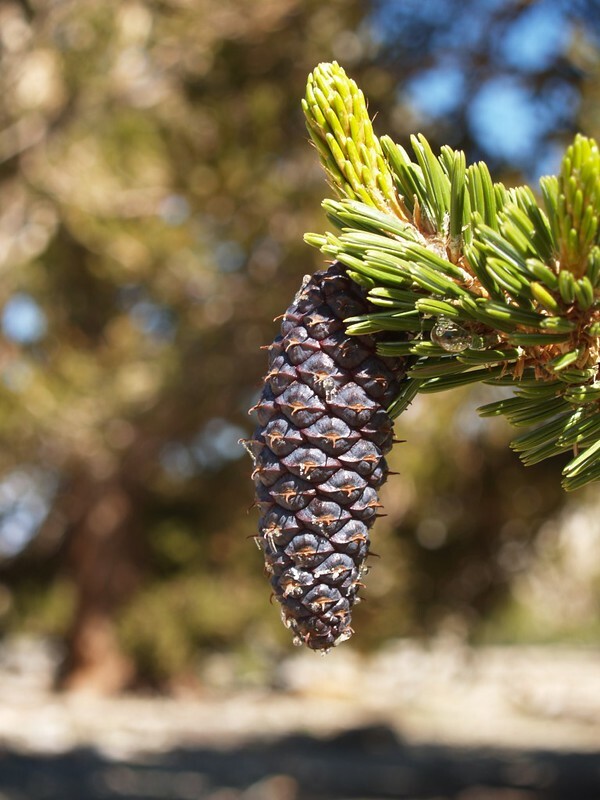 We also noticed as we drove that the bristlecones seemed to prefer to grow in the white-colored areas rather than the reddish-hued dirt. 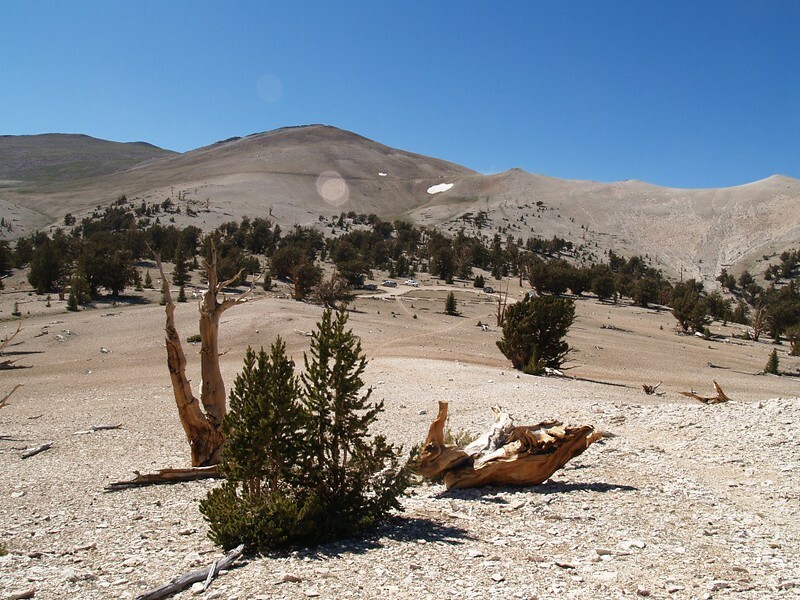 The white stuff turned out to be dolomite (limestone) and we noticed that the pines were the only plants that wanted to grow there. That’s one way of beating the competition: Live where nothing else is able to. We parked in the nearly-empty parking lot and took a quick hike around the main Patriarch Grove, an easy half-mile loop. Along the way we read all the informative signs and learned a lot about these amazingly old trees. 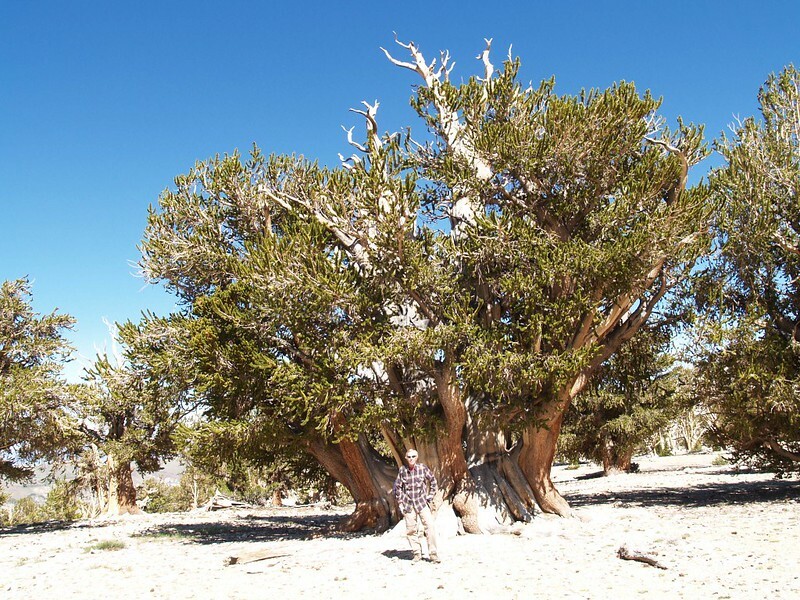 One of the trees was called “The Patriarch” and was considered to be the largest bristlecone pine tree in the world. It wasn’t the oldest (the oldest ones were back in that other grove we didn’t visit) but it was still quite ancient and venerable. Respect your elders is a good motto when you’re in the company of creatures twenty or more times as old as you. 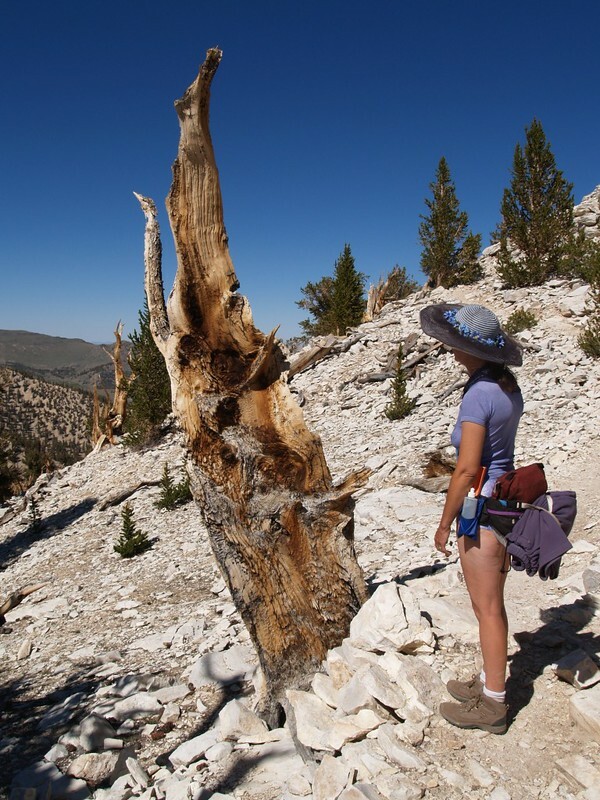 Bristlecone Pine Cone in the Patriarch Grove – it has bristles! 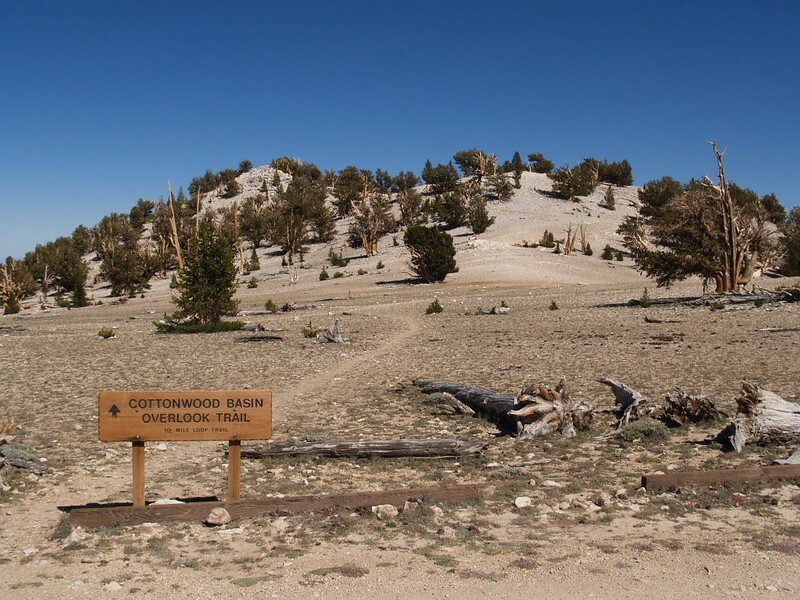 We still had time, so we decided to hike on the Cottonwood Basin Overlook Trail, which headed off to the east. The trail climbed an easy hill made of limestone, which was dotted with pines. 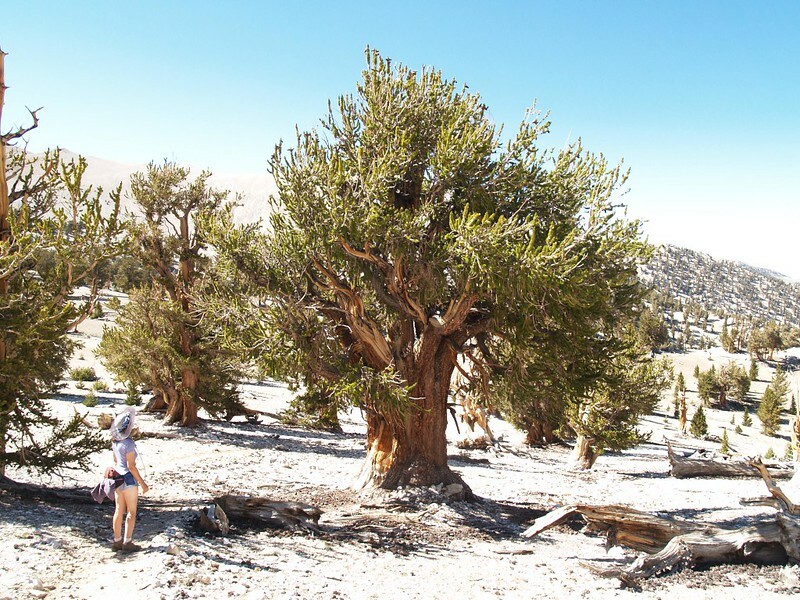 We checked them out, all the crazy-shaped trunks they made for themselves over the centuries, and learned that the weather is so tough up here that it can take centuries for even a dead tree to decompose. Some of those big logs on the ground were ancient, indeed. Soil? What soil? Termites? What termites? Even bugs had a hard time surviving up there. 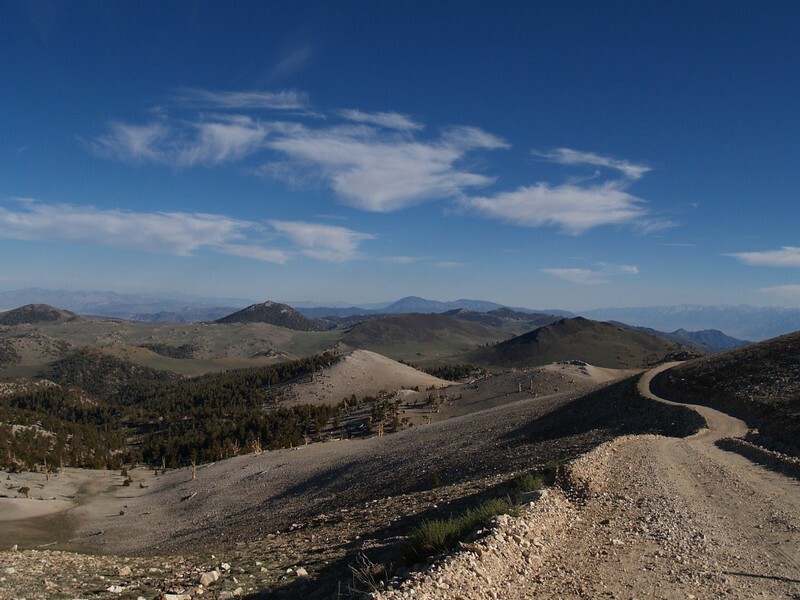 Eventually we reached the overview, which faced to the east, and we were able to see distant mountain ranges in Nevada from there. Sadly, the view of the Sierra was blocked by another ridge in the west, but we knew we’d see more of it soon enough. 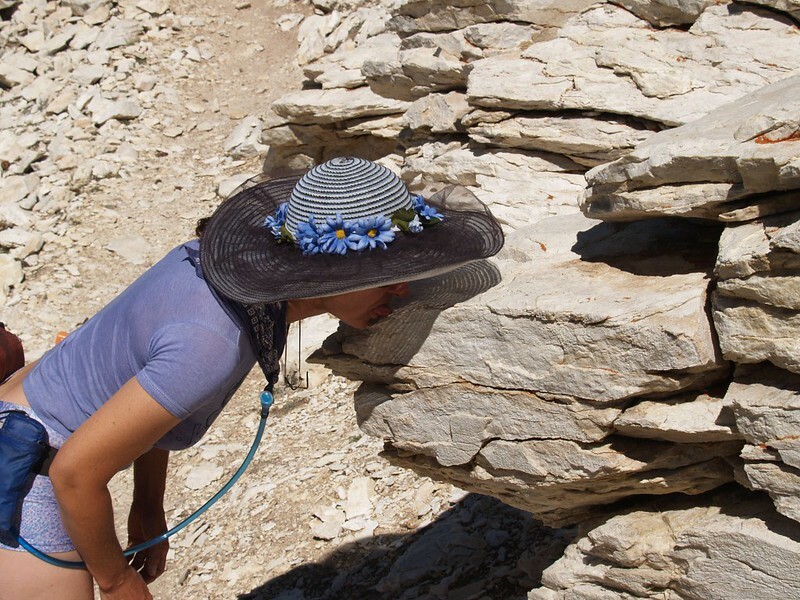 Vicki decides to taste the limestone rock that these Bristlecones seem to love so much. It tasted dusty. When we got back to the car we got ready for more dirt-road driving. Our eventual goal was the ultimate end of White Mountain Road, up on White Mountain Peak at 14,452 feet elevation, but we wouldn’t be getting all the way there by car. No, our goal was the locked gate near the Barcroft Research Station, where we would park and spend the night. Tomorrow would be our big hike, but I’ve written another trip report if you want to read about it. After that, it was time to head down the mountain, driving, yet again, on the beautiful “Flat Tire Highway” to a campground far below. 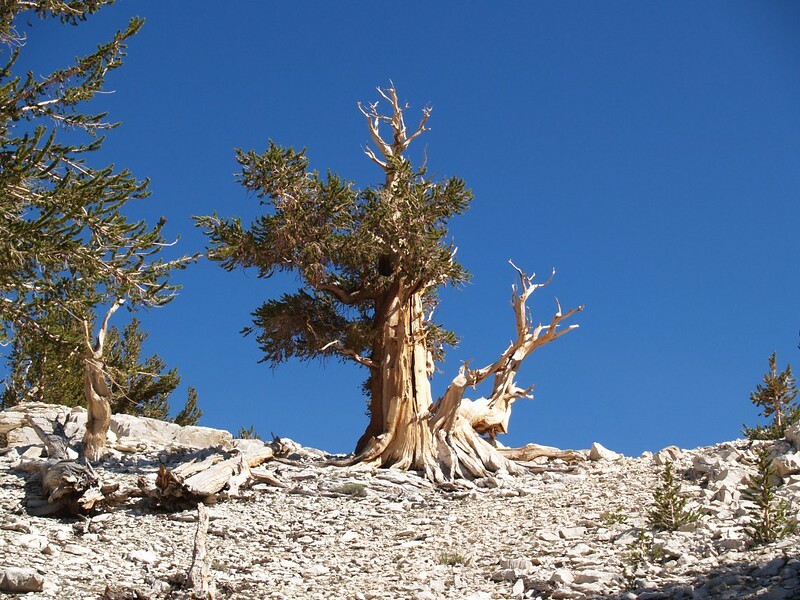 Although we’d visited the Patriarch Grove, we knew that we’d be back to visit these mountains and extraordinary trees. 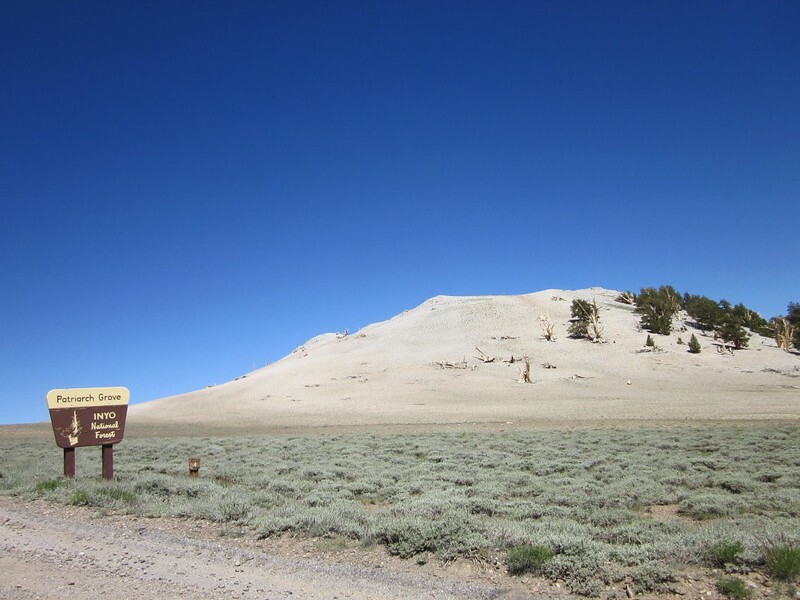 Indeed, the Schulman Grove and the new visitor center would surely make a visit worthwhile. 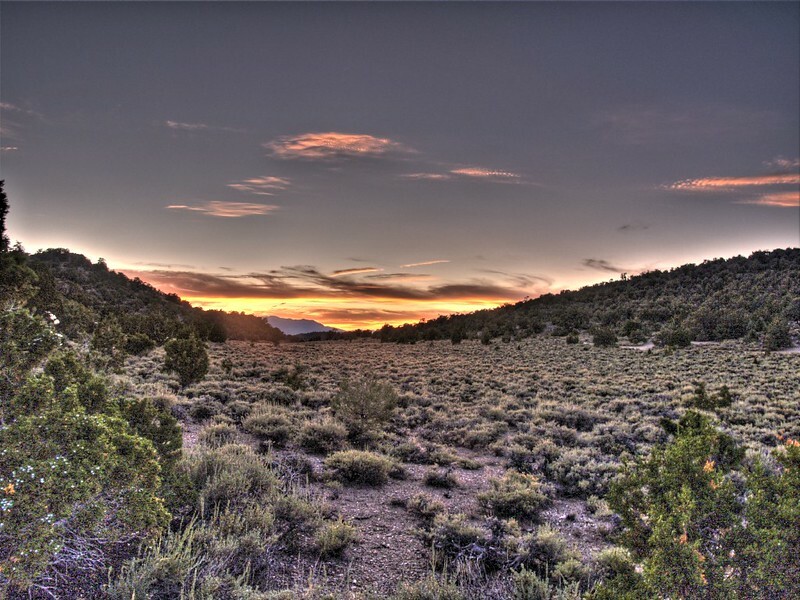 And we wouldn’t have to drive on a dirt road to get there. We’d be back!